The rain has finally eased off today, giving the cherry blossoms a chance to dry off and to maximize their beauty against blue skies. Life is still regularly irregular with baby B demanding all my attention and spare time. Yet, I recognize the need to make time for myself too and so today is the very first day I have hired a nanny to take B for the afternoon. I'm not sure who is more traumatized, me or B. To distract myself, I am writing this overdue post about a hamster, a cat, and a puppy with floppy ears. These pets were specifically requested by Simone to decorate her birthday cake back in March. You may remember her previous birthday cakes, including this one. Her mom was aware of my time restrictions and so decided to order the actual cake from somewhere else. 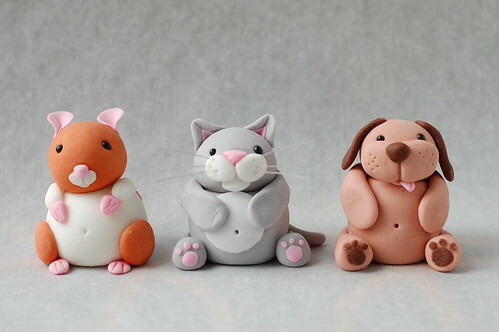 I like my fondant animals to be nice and fat, just like the plump ox, monkey and rat from the Chinese zodiac I made several years ago. B's first birthday is fast approaching too and I have no idea what to do regarding the cake. Do I go all out and create the most elaborate and spectactular cake just because I can? Or do I make something simple but memorable? I haven't decided yet. Eventually, B will just tell me what type of cake she wants but for her first birthday, this may be the only occasion that I have carte blanche. Recently, I have been feeling that it is all happening too fast, from the crawling and cruising to the emergence of her personality (seemingly strong-willed and defiant like me!). Soon, she will be weaned, walking, and chasing after the cat. Luckily, Simba is still nimble and not as overweight as this fondant cat, so she can hopefully escape B's clutches.